YZ (Yuko Zama): Gil and Lance, can you please tell me how and when the collaboration between you two started? GS (Gil Sansón): I have been an admirer of Lance's painting before I knew his music. Painting is part of my background. For quite some time I didn't make distinctions between music and painting, pursuing them both with equal passion and commitment. My first actual collaboration with Lance came out when he painted the cover for my release on Makam/Dromos, “Immanence, A life”. João Santos, the head of the label, did some brainstorming with me regarding possible artists for the cover, and we both had Lance at the top of our list. I contacted him and he did a beautiful artwork for my release. ‘Pra Mim’ is not the first score of Lance that I have interpreted. A couple of years ago I participated in Lance's score “Battle Maps, Battle Hymns: The Vast Field of Liberation”, interpreting two pages of the score. The project also included Joda Clément, Bruno Duplant, Lee Noyes, Mathieu Ruhlmann and Lance himself. It came out as a double CD on the US imprint Suppedaneum. LAO (Lance Austin Olsen): I originally became connected to Gil through Facebook, as annoying as it is in most respects, FB did open the doors to other composers and artists of all types without having to physically travel the world. I was working with Mathieu Ruhlmann under the name ‘Kiiln’, recording an album for Mathieu’s new label. It had been released and I was interested in hearing any feedback that was happening, Mathieu said Gil Sansón liked it, I was pleased that a composer and musician liked the work. Fast forward to the ‘Send+ Receive festival’ in Winnipeg where Mathieu and I had been invited to perform that year (2014 I think), we had decided that we should go to Minneapolis at the same time to perform with Jesse Goin’s ‘Crow With No Mouth’ series, I was particularly interested in meeting Jesse due to our parallel interest in Soto Zen and that both of us had been involved in Zen and Zen Meditation for many years. We were also students and followers of some of the same Zen masters. While staying at Jesse’s he had an album playing, it was an unreleased album by Gil. Meanwhile Gil had shown considerable interest in the paintings that I posted each week and so small conversations began to emerge in an organic fashion. Gil asked if I would be interested in doing a CD cover for his release “Immanence, A life”. I was really honoured to be asked but, not being a graphic artist and totally hopeless at layout, I asked another collaborator and friend Jamie Drouin, that if I supplied the painting, would he turn it into a CD cover, he agreed. Shortly after that I had been working on a series of small works that seemed to resemble battle maps. 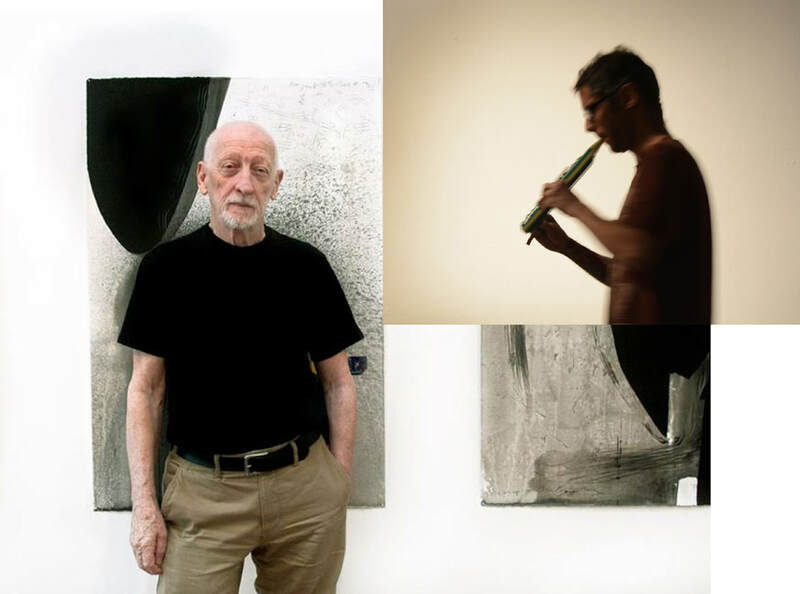 These works began to form notions of sound approaches and a way of realizing these as an integrated work using a number of musicians and sound artists. I asked a number of people via email if they would be interested in receiving a couple of images with some text and a time frame to produce 2 x 20 minute works, Gil was one of these artists. I received enough great work to put together 2 CDs and asked Joseph Clayton Mills if he would be interested in listening with the possibility of a release. He did and he released the double CD as “Battle Maps, Battle Hymns: The Vast Field Of Liberation”. YZ: Can you explain a little bit about the four pieces on this double album? GS: There were two scores: Lance's graphic score 'Pra Mim' and my graphic score 'Meditations' (Meditations on the history of music). What we have here are two interpretations of each score. I used the text that was part of 'Pra Mim' in full on 'Works on Paper' (read by A.F. Jones), and only a sentence on 'Fail Better', and selected two or three pages for each of my interpretations. I think Lance also selected some pages and the suggestions and vague indications of the text part of my score. Lance, in fact, has made four different interpretations of my score, one appearing on his recent CD on Another Timbre, and two on this release on elsewhere. My score was not intended as a painting or independent artwork. It was conceived with the notion that it would be interpreted by Lance and turned into a piece of music, so in a way it's a proper score, intended to be realized as music. LAO: I had all the pages of the ‘Meditations’ score and the text suggestions laid around my work space for a long time, being drawn in by this and pushed back by that until I began to work on the realizations, a lot of which would develop in my mind as a result of looking and forgetting and then half remembering. It would be difficult for me to point and say “This is Meditations #1, and this is #2”, etc. since the works developed in an organic fashion as I became more and more familiar with the overall look and feel of the complete score. GS: I followed a similar approach as Lance did. The difference was that I worked each realization in my mind until I had a clear image in my mind, and then executed them in a relatively short burst. I would think of sonic materials for their color, texture, shape, etc. I could easily extract another interpretation of ‘Pra Mim’, it's a score with a lot of identity and infinite potential. And Lance has proven fully that he can extract a lot of mileage out of my score. YZ: Lance, what did you think about Gil's graphic scores ‘Meditations’? LAO: One of the things that happened with seeing the pages of Gil’s score was that, firstly, there was breathing space both on each sheet and between each sheet; and secondly, his use of real world items such as receipts paralleled my use of real world items in both paintings and in scores/recordings. I was struck by a fragment of a canvas that had painted marks curving across a section of white canvas that began to resemble points of sound to me, and that is how I first approached the reading. I began to lay out points of sound using guitar, amplified ceramic water jug and computer and this became the structure of my first realization that appeared on the Another Timbre release ‘Dark Heart’. I also love to have some counterpoint that balances or is opposite to these initial sounds. I was intrigued by the underlying sheets of faint text that I could not read, because it was in a language that I did not understand and the organized areas of strong colours, particularly reds that lay across other fainter colours that read as a gentle underlying rhythm. ​YZ: How did Gil's graphic scores ‘Meditations’ actually inspire you to realize them into music? LAO: I had the score sheets laying around the studio for a while and began to realize that I was “meditating” on the paintings, if you will. I decided that I was going to open the first piece with a field recording of a windstorm that I had experienced in California which had beer cans and doors slamming and a hell of a lot of supermarket receipts blowing all over the area that I was visiting and I had made sure to record this fantastic event. This would be a natural occurrence with its own structure almost as the underlying texts that I could not read had their own structures without my complete understanding. I tend to make a lot of recordings that I add to my collection for use in the same way as I have tubes of paint of various colours that I use, I do not read musical notation but also I have no idea how paints are made. I collect them and bend them to my purpose of the moment, if you can’t make a painting with a couple of pre made colours you might as well give up. Gil is very clear with his written instructions, they do not point to specific sounds or notes but clear suggestions such as “Some sound surfaces, some sound gestures, some close, some far, some space or spaces” and also suggestions as to how to read silences and colour intensities. This gives me a very good idea as to his intentions overall without the use of unchangeable specifics. Gil’s conversations back and forth, which may have nothing to do with scores or recordings also enter my mind as fragments of a thinking man in a difficult situation who continues to work, and this colours my information palette. Gil also has a great interest in a wide variety of music including a lot of classical works that I also like. I have always tried to situate what I do somewhere between music and “not music” whilst not losing the connection to either and leaving open different possibilities. I hear a similar concern in Gil’s work and our conversations give me encouragement to plow forward into unknown (for me) territory. Despite all the various readings and approaches to Gil’s score, what happens on an intuitive level is that having the score lying around my studio, and moving it around and generally absorbing the images and text and spaces, and letting these things move around freely in my head, something comes to me from “somewhere”, it is a very intuitive but positive feeling that this is the direction for this work. YZ: Gil, do you feel a strong or close connection with Lance and his paintings to yourself? And if so, what do you think it is? GS: Over the years I kept thinking about how much we had in common as artists, as I got to know his music, and saw all the threads that communicated between the visual and sound aspects of his work, which I could very much relate to. One day we just said, "It's about time we do something together!" He had this graphic score ‘Pra Mim’, and I connected with it immediately on an instinctive way. You could say that I started hearing sounds and sound relationships as soon as I dived in into the score, and this in turn made me think about doing the same, writing a graphic score for him to respond to. Normally, I am somewhat weary of this way of working; I see it as an easy way out of some of the actual problems of composing music and a bit of an abdication of responsibility, but in Lance's case it actually felt like the best course of action, a proper way to reconcile with my past as a visual artist. In a very real way, I feel I don't have to paint anymore, since Lance is doing such a good job with it. As an artist, I try to make a difference, and this makes me move over quickly when I see that an area of interest is becoming somewhat popular, and then I move over to another, less travelled area. There are indeed many secret (or perhaps not self evident at first) connections between our works, because here we have two artists who are meeting each other at some common middle ground, without losing our identity one bit, but ending up with pieces that would have not being what they are if we didn't set to meet each other halfway, so this was a process of discovery and of venturing past comfort zones. YZ: How did (and do) Lance's paintings and his presence as your collaborator affect you for making music? Also, what are the natures or ideas of Lance's paintings (particularly Pra Mim) that inspired you to realize his paintings into music? GS: This work with Lance allows me to tackle different problems than, say, a piano piece. We move in a gray area, where things are not carved in stone, where instinct plays a much bigger role. At the same time, I wanted to explore musical correspondences between the images and the sounds. Notions like plasticity became much more important than, say, formal structuring devices and the whole process of this collaboration felt like breaking new ground, at least personally. Notions like filigree, gesture, washout, color, these became crucial to my conception when working my pieces. Also, the text Lance included on the score became paramount, suggesting many moods and subtleties, even adding some element of irony which I like very much. I had many paradigms in mind when working on my realizations: Fluxus, Cardew, Cage, but also the history of music and the history of art. I don't put these in hierarchies when I'm working, instead I let them roam free in my mind and observe the sparks when these elements coalesce into something that has possibilities of becoming concrete. There are so many layers on my two realizations, though this is perhaps more obvious in ‘Works on Paper’. ‘Fail Better’ feels to me like a very long, freeform song, but in ‘Works on Paper’ there's many relations and layers of content, musical, painterly and philosophical. The listener doesn't have to be aware of these, but they definitely play a very important part in the discourse of the piece. YZ: Did you study art and painting as your background in your early days? I am just curious how deep you were involved with painting before you became to be interested in making music. GS: About my academic background: I have none. I'm self taught in painting, drawing, writing and making music. In my mind, this is the best course of action for a person like myself, who's only competing with his own mediocrity. The way I see it, if you don't pursue formal education but still have a more or less clear idea of what you want to do, you can keep studying, while say, graduating from the academy can give you the wrong idea that you already know everything you need to know to pursue your craft, and I strongly believe that you never know enough, regardless of any accolades you might be getting, and it's best to keep studying all your life. Every day I learn something new about my craft, on my own terms. Knowledge becomes something to strive for, not a milestone but more like the always receding horizon. You never learn all that is there to learn, but at least each day you're a bit less ignorant than yesterday. To be clear: among the things I've learned on my own, reading and writing music are essential to my music making: I no longer rely on my memory to play my music, I no longer rely on the instruments I can play, and so on. Music is so vast that I want to have as many ways of organizing sound as I can. I see no contradiction between improvised music and written music, at least I hear the same composer's influences, with the same personality traits, both on my more formally structured music as I do in my more "experimental" stuff. I strive for beauty in both. You can make music that is both radically modern without sacrificing the idea of beauty, which to me remains essential and grounds me in the centuries old tradition of western classical music, so dear to me since I was a child. YZ: Your country (Venezuela) has been suffering a big crisis these days. How do you feel the current political, economic, social and all the other situations of your country affect your creative activities (or creative mind) as an artist? GS: As a matter of fact, I'm a very proud person and the last thing I want is to be perceived as a victim. I'm also quite stubborn and I’m sticking to my aesthetic agenda and refusing to turn to politics in my work, because I don't want my work to be reactive, but quite the contrary, I want my work to be an act of affirmation. In that sense, my work can be seen as political, because is the expression of my resistance. I have paid this stance by being blacklisted, but I refuse to take my work to their court. My activities have found many obstacles, from the government and from the private sector, under constant threat from the Maduro regime, and thus extremely cautious and playing safe in order to survive. Also, my music has a limited appeal, since it doesn't cater to the establishment, which prefers styles of music that have proven to be popular, plus my music offers little in terms of showmanship or virtuoso playing, has little overt drama, etc. It is the fact that my work has found sympathetic ears abroad that has made me focus on my "international" career and reputation (the situation at home means I am unable to tour and promote my work as I would like to, making me dependent on records and long distance collaborations), and in this regard I have to say that I've been very lucky. I've found much appreciation among musicians and selected critics. In particular, people like Antoine Beuger, Jürg Frey, Manfred Werder, Michael Pisaro, Eva-Maria Houben, Bruno Duplant, Lance Olsen, Alan Jones, Cristian Alvear, Simon Reynell, and many others, have shown me constant support and feedback. I owe them a great deal of gratitude and I hope to be able to pay it forward when I can. YZ: In your graphic scores ‘Meditations’ and also your realizations of Lance’s scores of ‘Pra Mim’, I found a sense of 'urgency' that feels to resonate with the darkness of the social climate surrounding you, yet in a great balance between a pure desire for artistic creativity and the reality of where you live in (or a balance between detachment and involvement), which seemed to expose and extract the ultimate beauty in a bare form. It is not like just an emotional outburst, but also has some objective tranquility like a philosophical attitude. Of course, my observations are based on a complete outsider's view, but how do you feel this relation (or influence) between your works (or your focus on creative works) and the current surrounding situation? GS: You are very perceptive in that beauty reaches an existential dimension in the midst of the horror, and it becomes an imperative, a strategy for survival in the spiritual sense. A couple of years ago I had the opportunity to present a concert of Wandelweiser music here in Caracas, with works by Beuger, Houben, Wolff and myself, and the response from the public was very gratifying. People told me how delighted they were to be able to enjoy an hour of peace, quiet and considered small sounds, in a city as violent as ours. This is where I can consider the political dimension of what I do in a positive light, because it's not about telling anyone what to think, we simply offer our music, with care and respect for the audience, and we think that this music is for everyone who shows interest, not just record collectors and people "in the know". No one came after the concert asking to buy CDs, but the comments and feedback showed deep gratitude, and this is the most important thing for me. During that hour there was no Maduro, no armed gangs, no heated political discourse, no stress. People could hear both the music and the sounds from the environment, without making judgements, just being there with the sounds, in a very real utopia for the duration of the program. The balance between detachment and involvement, as you point out, is essential in order to avoid excessive drama and pathos, which in my opinion hinder the music and can turn expression into spectacle or illustration. When the music is self contained in discourse, I’ve found, it can find its audience without compromising itself and without imposing an agenda on the listener. It may been existential imperative for me, but I believe the music is not about my personal (and collective) ordeal. At the most, I would say that the hardships have only shown me that my commitment is for real and no amount of political repression and abuse can move me from the path I have chosen. I would be far more productive if my country was free, politically and economically, but the situation, as dire as it is, has not stopped me from trying my best and the work itself is its own reward, however limited my resources would be at the moment. I'm lucky in that the work keeps me from falling into depression, primarily because I believe my best work is ahead of me and I’m always learning. YZ: How do you feel about the result of this double collaboration CD of you two? GS: There is a conceptual unity to the four pieces that I like very much. The double CD release form seems much more than justified here. Also I think that the four pieces do not shy from expressing emotion, the music does not sound like conceptual music at any time. In the sense of experimental music, neither of us could have predicted the outcome at first, but we did have the feeling that it was going to work. We are both really proud of the results, and we can also see new projects in the horizon, no doubt with more experimenting and higher stakes. Our collaboration is still ongoing and pointing to new and exciting places. If I didn't work at my current slow pace I would probably be already deep into it, but even at my current snail's pace I can already see new adventures ahead. Right now, I'm organizing my thoughts after studying Lance's new score. LAO: Well, I think the whole process was a lot of fun in the end and the works themselves blend together so well as Gil says, there is a conceptual unity to the whole project. What amazes me was that once I had Gil’s score I set about realizing the works and never once asked him “How does this sound to you?” I just did what I did based on what he had sent me, then sent him the finished files. I think the resulting 2CD set is work to be proud of and that includes the layout and production of the complete package. Gil and I have other work cooking in our heads and from my point of view taking a big leap forward is something that I am looking forward to. YZ: I have one more additional question which I was meant to ask you earlier. Both of you used short excerpts of other musicians' recordings or compositions as samples in the first track of the two discs: Pra Mim #2 and Meditations #3. I was impressed with how organically each excerpt of music was incorporated as a subtle (and sometimes hidden) component of the entire piece, to create an exquisite balance between elegance and rawness (or tranquility and disquietness). These samples made each piece a memorable collage of sounds in which all the components seemed to be indispensable. How did you decide to use these particular musicians' performances and compositions as samples in your pieces? Or, what was your intention of using those samples in these particular pieces? LAO: It is a complicated question for which I have no definitive answer, as a painter I tend to view everything as one form of painting or another, whether using visual pigments or audio pigments (sounds). As I am not a musician that plays any instrument in a traditional or logical fashion I have to rely on my intuition and experience with collected sounds, created sounds in the studio that were not necessarily created for a particular piece, and collaging these elements into a work that is more that the sum of the pieces. All these elements go into my sound palette in the same way that tubes of paints sit around waiting for me to call on them, and I use the same tubes of paints for pretty much every painting. The idea is that I should be able to produce an endless amount of works using the same few elements but the works are always different and travel along trajectories that slowly change as I work and age and see things slightly differently. With regard to the ‘Meditations’ series, I had already produced the first “Meditation on the History of Painting” in which I had been looking for a ‘meditative’ element and I had come across a collection of wax cylinder sounds that I had collected a few years back. One of the pieces was a traditional hymn and once I had pitched it down and in combination with the noise of the ancient recording technique, I found that it suited the overall work perfectly. It acted as a counterpoint for my guitar sounds and my chopped up modern speaking voice. Put together these elements became something much more than the whole and it sounded to me as Gil’s score looked to me. When it came to the second and third realization I wanted to follow this same trajectory but not produce an additional 30 minutes of the same thing. It was important that they all related since they all came from different viewpoints of the same score. I had decided to use a wax cylinder recording again which would supply the meditative element as similar to, but not the same as the first realization (Meditation on the History of Painting) I had both new realizations pretty much done to my liking but I was looking for something else that had some strong relationship to events in Venezuela as well as being strongly tied to the realization from Gil’s score. I was going through my files and I saw the file marked “Craig’s Stroke-not used” The work “Craig’s Stroke” was finished and mastered although not released so these files would never be used for what they were intended for. My method is to never throw anything out particularly my recordings based on my scores and I am also comfortable folding other of my works into new works as I do in visual collage. I came to the short piece with John Luna saying “Hit me” and some nice organ moments from Debora Alanna. I knew instantly that this was the perfect finishing touch. As I said before a lot of this is intuitive and since my working method is mostly collage built around an initial concept, I am open to suddenly hearing the last element for an almost finished work in unusual places. GS: The reasons that made me use samples for this piece are manifold. Some are practical, some are deliberate. The practical reasons had to do with my limited means of soundmaking at the time: it's very likely that I would have played everything myself if I had the proper means. Not having that possibility, I had to do it "with a little help from my friends", so to speak. I was already well prepared, from a technical and aesthetic point of view, after my piece ‘Untitled (for Pierre Boulez)’, which was made out of samples from the music of Boulez for the most part. My conception for ‘Works on Paper’ involved many sound sources, the piano being one of them. At the same time I didn't want to sample other people's music for this element, so using snippets of my own compositions, as played by Dante Boon, seemed the logical thing to do. The other sample in the piece is ‘Hier Ist Friede’, the last of the Altenberg Lieder by Alban Berg, a composer that is very dear to me. When compiling materials for my realization, I recycled a piece I did for an unrelated event, selecting fragments that were already composed, so the sample appears along my own playing of the cello (my skills on this instrument being extremely modest) and later on by Dante's. In the context of a score like Pra Mim, a sample is more of a found object, much like a Lucky Strike cigarette package in a Robert Motherwell's collage, it's not really appropriation, it's much more related to collage aesthetics. Lance often uses photographs as elements inserted in his paintings, integrating them by not integrating them, in a manner of speech. I think also about the phenomenon of quotation, that's so common in classical music, Berg being a very good example, as he used quotation to great effect in some of his music, like the Violin Concerto or the Lyric Suite, so perhaps there's an element of commentary in a historical sense. All of these thoughts, however, are an afterthought, since my preoccupations while devising my realization tended to avoid the written language with all that it entails, and went for a strategy of thinking in images, and to translate visual images to sound images. As I said, my current situation forces me to work with the bare minimum when it comes to resources, proper recordings, etc. At the same time, I am very lucky to have the support of many great artists and an ongoing dialogue with them that doesn't always finds its way into a recording, so there's an element of autobiography, perhaps, in some of the contributions and samples, for example, the fragment of ‘Monodies pour Mallarmé’ by Antoine Beuger, a piece I play often on melodica, and that I've programmed in concert here in Caracas, alongside Anna Rosa Rodriguez on voice. It's a piece that means a lot to me and that always seem to create its own space around it. At some point, it seemed a perfect fit for the longest piece, ‘Works on Paper’, and I selected a few fragments of a live recording we made in 2017. Like I said, I have an ongoing dialogue with Antoine Beuger, one that has produced some music on my part and much encouragement from his part. I owe my friends in the community a great deal, and this somehow reflects in the music, in sometimes obvious and not so obvious ways. A similar case happens with Dante Boon, who was the first pianist of renown to inquire about my piano music, and for whom I wrote two piano pieces. He plays my music with great sensibility and insight and I feel fortunate that he has engaged with my music in such a sensitive way. I think, in retrospect, that this friendship in music seeped into ‘Works on Paper’, as the limitations I encountered when realizing Lance's score a second time pointed me towards a more humble stance, one that recognizes that I wouldn't get too far without these musical friendships, which are a real lifeline and that I don't want to disguise anymore. It's an ongoing dialogue that I hope to keep and nurture, and that goes beyond sampling or quoting. In this sense, I'm as grateful to Dante, Alan and Antoine as I am to Alban Berg, but of course the dialogue with the artists that are active today is much more dynamic and unpredictable.